Who to deport first? How about Sebastian Gorka? You read this week that former Trump national security advisor Sebastian Gorka, who flaunts his connections to an anti-Semitic group, had a warrant out for his arrest in Hungary during the time he served in the presidential administration? 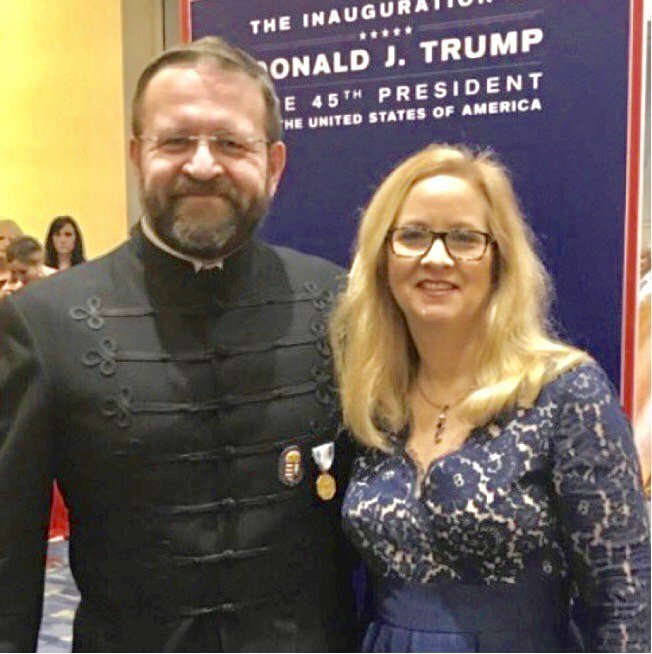 Gorka is a naturalized American citizen but lived for years in Hungary, during which time he tried to launch an extremist rightwing party there. The warrant is for unspecified firearms charges, which seems believable given that, just two years ago, he carried a gun into Reagan airport. Please remember that a man too stupid and disrespectful to remove a gun from his person was had significant responsibility for keeping us all safe. Above, Gorka and his wife at Trump’s inauguration. He wears medals signaling his support for an order that allied with the Nazis during WWII. In other words, Trump is right: we have a problem vetting our immigrants and removing ones who break the law.